So you have some French friends, and you think it would be great to practice your French with them, and naturally, you ask them to correct your mistakes. Although this may sound like a good idea, it often turns into a nightmare both for you and for them. Here is why. Learning French can be tough. And it takes time. You cannot be perfect right away: it’s likely that you’ll make mistakes. Many mistakes. If the most important ones should be corrected, it’s a rare skill to know which mistake is bad, and which one can fly. And most people are very bad at making this distinction – especially French people. 2 – Why do French People Always Correct Mistakes? The French are quick to correct foreigners learning French because we are accustomed to correct our children all the time. Until a pretty old age, grammar is a mystery for French kids. They learn the language through constant corrections and repetitions. So it’s almost a reflex for a French person to correct a mistake… the corrections leaves our mouth before we even think about it. And it’s often really badly seen by foreigners. So think twice before encouraging us! Furthermore, your acquaintances are your friends, not your teachers. You want to relax with them, not be in “classroom mode”. Because, unless they are teachers, they won’t be able to explain most of the mistakes you make. And this is frustrating for both parties. Worse – I’ve seen many French people inventing rules on the spot: the explanation is then more or less correct, but in any case never clear. 4 – Who Should You Practice Your French With Then? Believe me, if you want to practice your French with friends, go ahead, but tell them NOT to correct you unless you are saying something really embarrassing. They don’t need the hassle of correcting you, nor do you need the constant embarrassment. And if you want someone to correct you in a constructive way, then take phone or Skype French lessons with a certified French teacher, who actually knows the rules, will tailor a structured program to fit your needs, and mostly, will gently correct you but mostly constantly encourage you, because they know that building your self-confidence in French is essential. 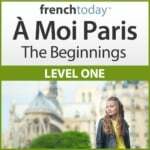 The best way to learn French is to learn French in context: check out French Today’s downloadable French audiobooks: French Today’s bilingual novels are recorded at different speeds and enunciation, and focus on today’s modern glided pronunciation.